Where is the Community Gallery? To see a clip about The Community Gallery and our tenth anniversary exhibit, click HERE. What is the Community Gallery? The City of Santa Fe Arts Commission’s Community Gallery— through thoughtful and creative programming— offers inspiring exhibitions for the public, educational and professional development for local artists/artisans and exciting activities for the community. High quality art is for sale at all price levels. 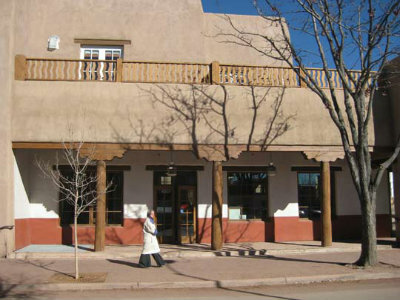 The Community Gallery promotes, sells and exhibits the work of New Mexico artists and artisans, with the emphasis on Santa Fe, through exhibitions, professional training and community involvement in the arts. Gallery programming provides a range of services, exhibitions and activities that engage the public as well as support the efforts of local artists/artisans. As a result, the gallery is a hub for viewing and exhibiting exciting artworks and brings the community to art as well as art to the community. How Do Artists Get Involved and Participate? The City of Santa Fe Arts Commission, in a concerted effort to expand services to the local arts community, welcomes artists and artisans of all media to participate in the exhibits and programming of the Community Gallery. The Community Gallery features themed exhibitions that run for two to three month intervals and display the full breadth and depth of the art produced by local artists and artisans in Santa Fe and New Mexico. Themed exhibitions ensure that both contemporary and traditional work in all media are shown, creating more varied, interesting and vital exhibits. Calls for Artists for upcoming exhibits are posted here on the Gallery's webpages with a description of the exhibit theme, deadline for applying, and instructions on how to apply. New calls are also sent out by email to those artists who have signed up for email notice. You may subscribe to our email notices about Calls for Artists, new exhibit openings, public art and other artist opportunities by clicking HERE. Exhibitors will be selected based on the quality of their work, their contribution to the full breadth of the exhibit media, and the appropriateness of their work to the theme (if applicable). How Does the Community Gallery Operate? All work in the Community Gallery is for sale. Artists not represented by a gallery receive 60% of all sales and the City of Santa Fe keeps 40%. Artists who have exclusive representation contracts participate through their gallery. 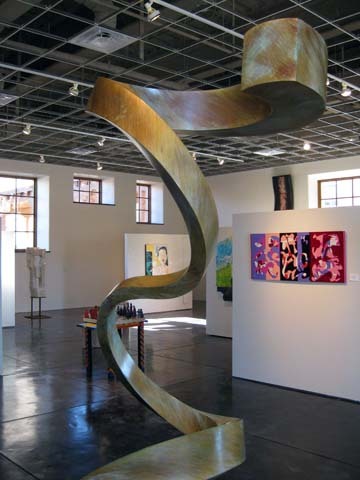 The representing gallery receives 70% of sales (to be split with the artist according to their own agreement) and the City of Santa Fe receives 30%. The City of Santa Fe Arts Commission Community Gallery seeks to be an engaging, dynamic showcase for local art. The Gallery brings art to the community as well as the community to art. In keeping with this spirit, the Gallery accepts theme proposal ideas for upcoming exhibits, allowing Santa Feans a hands-on role in developing exciting exhibits. Exhibits are currently being planned for summer 2019 and beyond. Theme ideas are accepted throughout the year. For more information, contact Rod Lambert, Community Gallery Manager at [bot protected email address] or call 505-955-6707. Community Gallery exhibits feature approximately 30 artists each. The Gallery does not present one-person or small group exhibits. All artists are selected through an open call to artists and juried by a selection panel. Theme proposals are evaluated based on five criteria, with the most successful proposals addressing three to five factors. How Can I Contribute Exhibit Theme Ideas? 1) Coordinate with significant local cultural or social events. Does the exhibit take place during a time that synergizes with other local events, enhancing the experience of both residents and visitors? Please note that events do not need to be arts specific. Examples: Indian Market, Spanish Market, Opera Season, Black History Month, etc. 2) Provide an opportunity for local artists/artisans to expand their professional exhibition experience and enrich professional disciplines through meeting press requirements, interacting with the public, performing demonstrations, assisting in workshops, etc. For some artists who participate in the Community Gallery, the opportunity to exhibit their work is a first time experience. This includes not only creating work, but gaining important skills in considering installation, entering contracts and advertising/promotion. 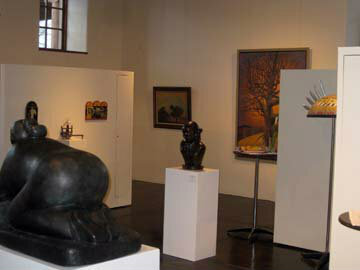 It is the goal of the Community Gallery to offer professional experiences for artists in all stages of their careers. 3) Reference the continuum of the society and culture of Santa Fe and/or New Mexico. Does the exhibit serve to illustrate the unique social and cultural qualities of Santa Fe/New Mexico? Does it have the potential to educate the community on contemporary social issues via juxtaposition with historical trends? Exhibits that compare and contrast ancient and recent history are encouraged. 4) Offer educational opportunities for the community to better understand local art/artists, artistic processes or art history. What opportunities does the exhibit proposal offer for educational programming components? As a function of exhibits, free programming opportunities for workshops, lectures, panel discussions and demonstrations are held in the Gallery to illuminate the content of the exhibit. 5) Collaborate with a minimum of two local community organizations to offer the widest inclusion of the public and create a synergistic forum for the advancement of the arts. The Gallery strives to collaborate with local organizations both within and outside of the arts. An exhibit theme has greater impact if it leverages the resources and insight of sometimes unlikely partners. 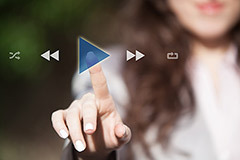 A second/third opinion in the development of a theme idea often results in a more thoughtful and successful exhibit. One goal of the gallery is to offer the broadest inclusion for all artists and involve a large portion of the local population by offering more than the display of artwork. Exhibitions feature programs and events that invite a varied and diverse audience. Interested parties are encouraged to submit their theme ideas using the Gallery Exhibit Proposal Form. The Gallery offers the opportunity for local organizations to host POP UP Exhibits in the Community Gallery space for two week periods at various times during the year. These spots are limited by the primary Gallery Exhibit schedule, however, between exhibits there is an availability of space for exhibits from organizations in the community. Interested parties are ecnouraged to submit theme ideas following the terms on the POP UP Exhibit Guidelines.